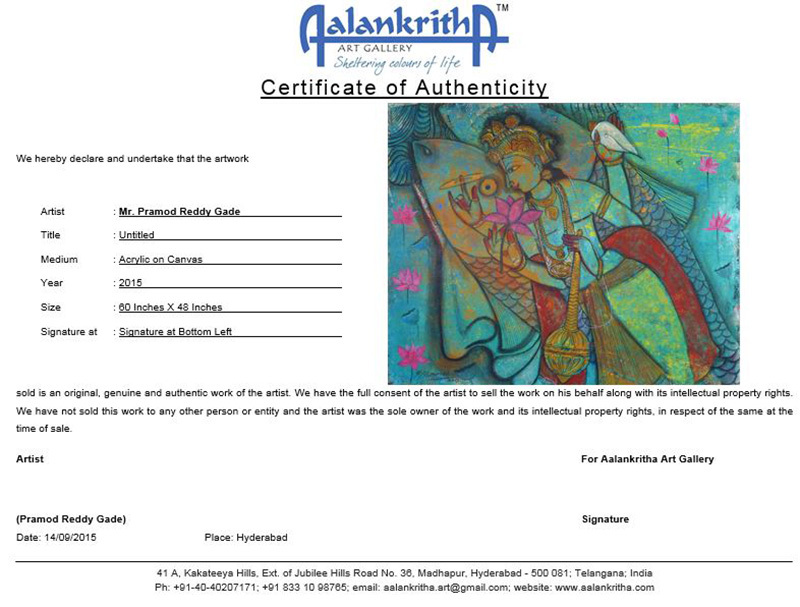 Aalankritha Art Gallery provides an assurance that each piece of art work which we sell, is a genuine work of the artist. All our works of art are sourced from authentic sources and the artists themselves. The artworks are screened and authenticated by the gallery and experts. Buyer is deemed to have satisfied themselves about the authenticity of the art work they would be buying, yet if a Buyer is able to prove to the satisfaction of Aalankritha Art Gallery that the art work is not authentic, Aalankritha Art Gallery will refund the sale price to such a buyer provided such buyer brings to the notice of Aalankritha Art Gallery within 7 days from the date of delivery of the art work in question of the discrepancy. Only the actual buyer can make the claim and should provide the supporting invoice. The benefit of the claim is not assignable to any other person and ceases as soon as actual buyer transfers the right on the art work. If buyer is able to prove art work is not authentic then art work should be returned in the same condition that it was purchased in.